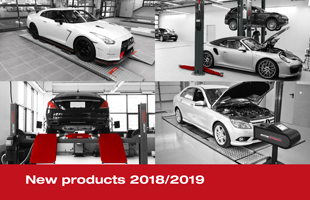 Information on the new AUTOPSTENHOJ brand – the product portfolio of which since the summer of 2016 also includes test equipment. In view of the institution of brake tester regulation 10/2011 (HU §29, StvO Germany) and a date of expiry of the transitional period of December 31st 2019 AUTOPSTENHOJ had to act on reconverting to new and innovative test techniques. Our products comply with regulations and demands and offer safety in investing in these components. Offering a large program of optional extras you can easily through “plug and play” make a new module. The patented and fully automatic system and the patented drive-on device make working with the equipment very easy. AUTOPSTENHOJ moreover offer special package solutions for the various leading car manufacturers, i.e. developed and constructed in cooperation with same. In future the product portfolio covering test equipment will also include a wider range of test equipment for trucks. Besides developing new products AUTOSTENHOJ also focuses on training, and has thus developed a new up-to-date training program, which will become available as from January 1st 2017. Our aim is to get a calibration approval in a cooperation with DAkkS and esz AG Calibration & metrology.